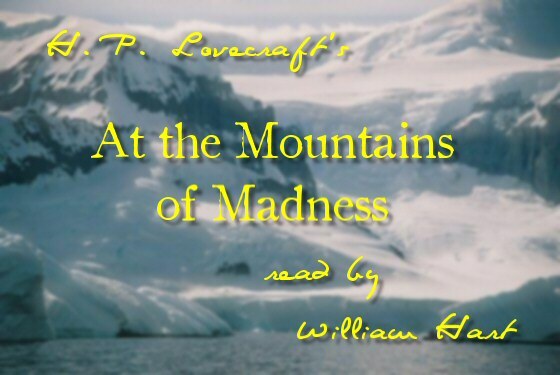 ← William Hart’s Reading of Lovecraft’s “At the Mountains of Madness” Joins His Reading of “Fungi from Yuggoth” on YouTube! H. P. Lovecraft’s, “At the Mountains of Madness” Chapters 01-04 Read By William Hart Are Now On YouTube! I couldn’t resist taking a detour from working on Chapter Five of “At the mountains of Madness,” so I could create the “video” files of Chapters 02-04 for posting them on YouTube along with the already posted Chapter 01. In the process, I also ended up reworking all three parts of Chapter One with a larger selection of images for more variety too. Check them out, and let me know what you think of this idea for getting Lovecraft’s unabridged works to a more video oriented crowd over at YouTube; and also as a way to bring some of them back here to discover more Lovecraftian items and links. Now that my detour is over, I’ll get back to my focused work on Chapter Five. This entry was posted in 1920's, 1930's, At the Mountains of Madness, Audio, Audio Book, Audiobook, Book, Books, Elder Ones, Fiction, Free, Guillermo del Toro, H. P. Lovecraft, H. P. Lovecraft Updates, James Cameron, MP3 Files, Readings, Universal Studios, Video, William (Will) Hart, YouTube, YouTube Updates and tagged 1920's, 1930's, 3D, At The Mountains of Madness, Audio Book, Audiobook, Book, Books, Cameron, del Toro, Fiction, Free, Guillermo, Guillermo del Toro, H. P. Lovecraft, James Cameron, Lovecraft, MP3, Universal. Bookmark the permalink. 2 Responses to H. P. Lovecraft’s, “At the Mountains of Madness” Chapters 01-04 Read By William Hart Are Now On YouTube! Just finished watching and listening to chapter four on YouTube. Very enjoyable. My friend’s wife is currently touring on a cruise ship in the Antarctic, and it was very interesting to see the landscape that she is touring. Hopefully she will not wander too far from the boat. . .